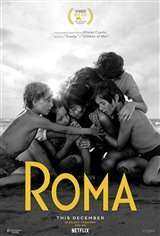 In 1971, Cleo (Yalitza Aparicio) works as a live-in housekeeper for a middle-class family with four children in a neighborhood known as Roma in Mexico City. Treated at times as a beloved member of the family and at other times as an outsider, Cleo loves the children, but has to deal with her employer Sofia's (Marina de Tavira) frustrations, as she deals with a husband who's a philanderer, who eventually leaves her. Meanwhile, there is student unrest in the city, making the streets somewhat dangerous to navigate, and an impending earthquake.